Forget Instagrams of hotel infinity pools. No amount of filters can top nature, as this extraordinary new video attests. The footage, captured by Iain Miller of Unique Ascent, was shot in a sea cave beneath Owey Island off the coast of Co. Donegal last weekend. "The sun enters the cave at the correct angle to create a Blue Lagoon effect, and the result is a surreal infinity pool which feels like you are suspended in light," Miller told Independent.ie Travel after his trip. The adventure guide paddled to Owey with colleague Fiona nic Fhionnlaoich, planning an early departure to catch the sun during its midsummer rise. 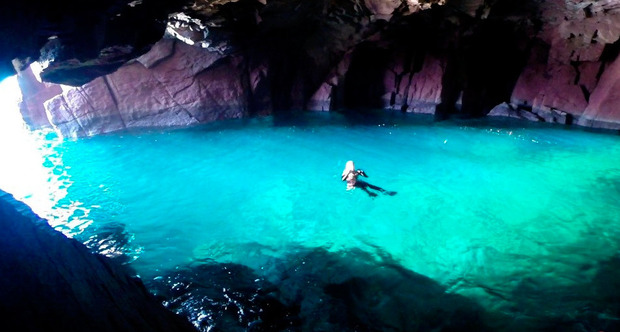 The 'Blue Lagoon' effect he describes can be seen in sea caves all over the world in the right conditions, of course - but accessing them is the issue. "It is a tricky matter of timing, sea conditions and sheer good luck to witness the effect first hand," Miller says. "To have the planets align and to be able to visit this natural phenomenon is a world-class, surreal and humbling experience. "The film only gives a glimpse into the heat, light and colours. It felt like you were swimming in light in an underground infinity pool." "In a granite cave, the walls will glow with all the colours of the minerals contained within the rock," he adds. "The walls and ceiling of the cave began to shimmer in reds, purples, oranges, and pink as the sea glowed a bright, greeny blue." Needless to say, you should not try this one at home. Kayaking, exploring and caving can all be dangerous activities - even moreso when bundled together in an intrepid expedition like this. Extensive nautical and local knowledge were required to pull it off, Miller says, with a short window of opportunity and tidal sea movements requiring a lot of marine and logistical planning... particularly with rock so close to hull and heads. "The fact that you are underground (before sunrise in near dark) in a cave facing open Atlantic Ocean means the chances of mishap are incredibly high." Miller has undertaken several pioneering adventures on the west coast, including climbing Mayo's iconic Dún Briste sea stack. Read more about his latest trip on uniqueascent.ie here. NB: The activities described in this article were undertaken by professionals at their own risk. Kayaking and caving can be extremely dangerous, and should never be undertaken without suitable levels of expertise or fully qualified guides. 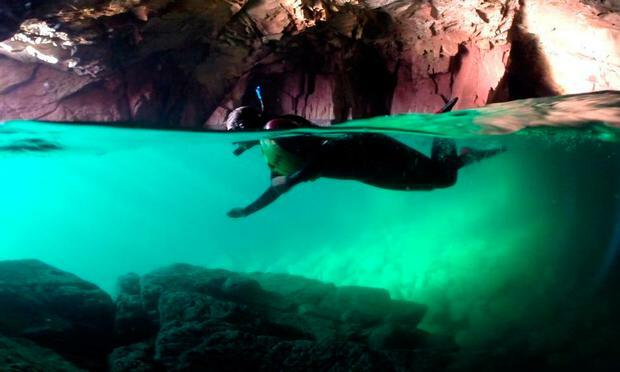 The Irish Adventure Bucket List: 25 days out to try before you die! Pól Ó Conghaile The more connected and developed our land becomes, the harder it is to find off-radar spots you can have to yourself... if only for a few minutes.